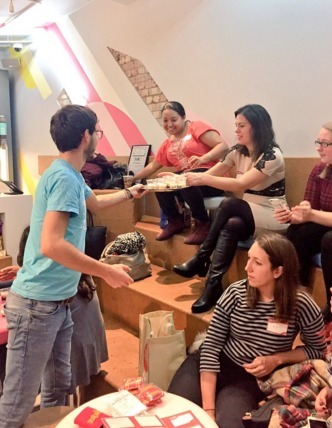 Earlier this month I wrote about the #YelptoberFeast which was a month long festival of free food and free drinks at cool venues across London? Sounds too good to be true? It’s really not – to redeem free treats all you had to do was download the Yelp app and check-in to the venue’s profile on the app. And that’s not all as Yelp also organised special events through the month of October that were open to all people who RSVP-ed using the Yelp app or the Yelp website. They were all pretty unique including an escapology lesson and an ice-cream making masterclass. I kept looking at these and wishing I was there until I finally downloaded the app and signed up for a Bubble Tea masterclass at Biju in Soho. 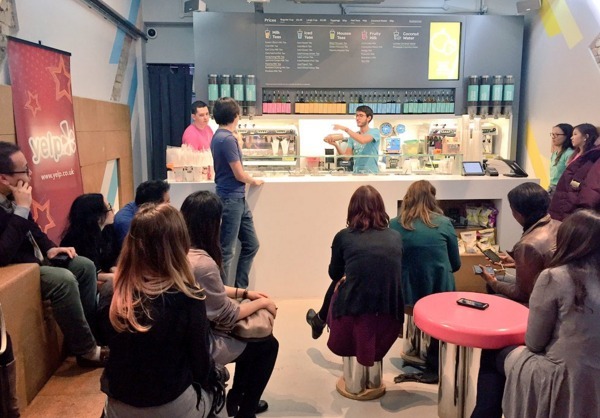 The event started with an introduction to what Bubble Tea was all about. 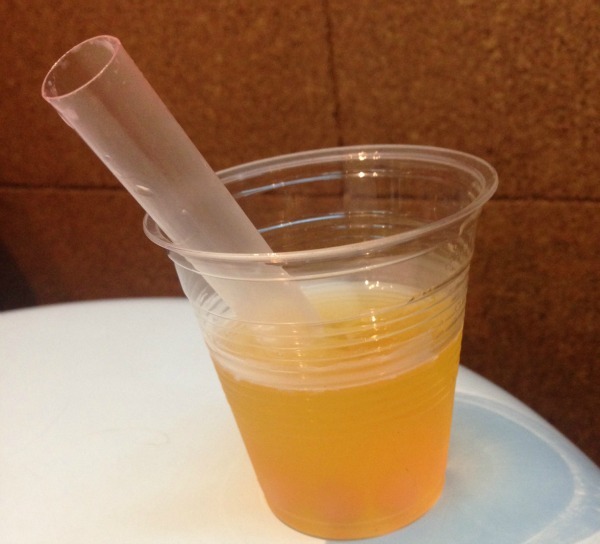 This was very useful because although I tried Bubble Tea when I visited Beijing, I had no idea what it was or what the chewy balls in the bottom consisted of. 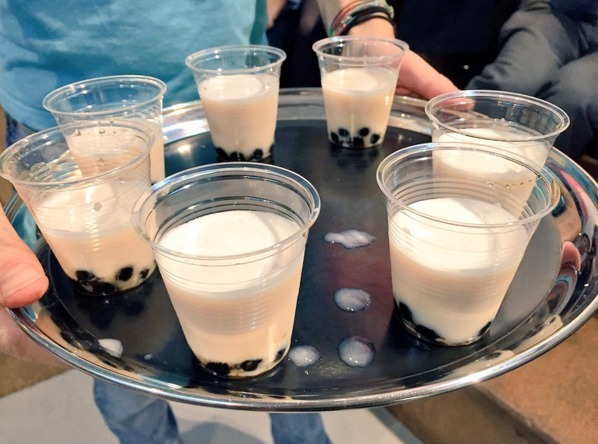 Basically, bubble tea originated in Taiwan as a street food with tapioca pearls at the bottom of a cup of tea, sipped through a large straw so you occasionally get a chewy ball in the liquid mix. 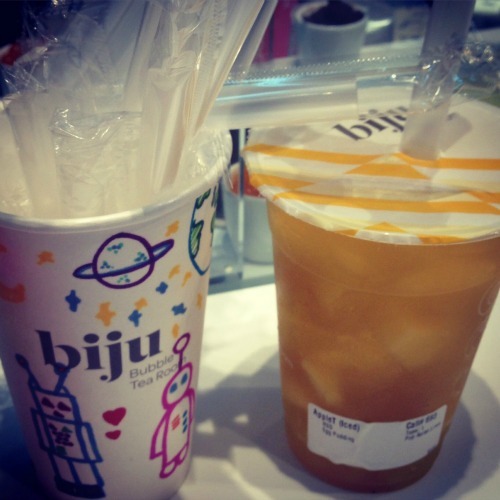 Biju is next level bubble tea, experimenting with tea flavours and pearl flavours (including exploding pearls) to give us all a healthy, fresh and tasty drink that we can customise to our own tastes. The essence is the same in the fact these drinks come with sweetie like things in the bottom, but you can have fruit teas, milk teas and even mousse based teas. Not a tea fan? That’s cool – you can also bubble up your coconut water! We were all given an Earl Grey based tea to start with. All tea is brewed fresh, using fresh milk or almond or soy milk if you want a dairy free alternative. 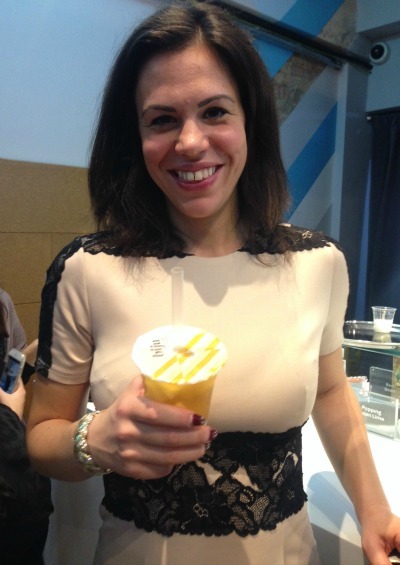 The black tapioca pearls are the most traditional variety and I loved the chewy texture. Next up was peach ice tea with exploding guava pearls. To be honest, I was expecting them to taste like popping candy that you buy from the candy stores, but it’s more subtle than that. What happens is that the pearls explode as you bite them, giving you some guava juice in your mouth. Peach and guava went so well together! 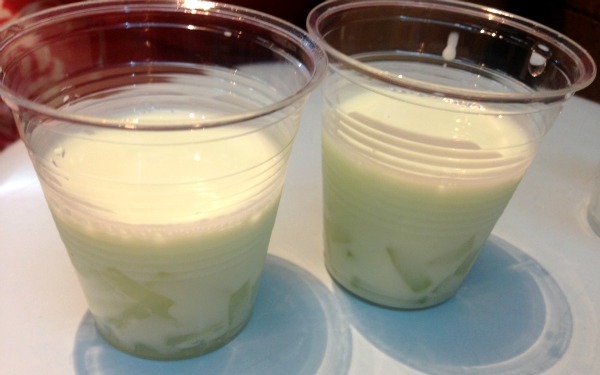 After that, we tried watermelon milk tea with coconut pieces. It didn’t look very appetising but it was my favourite of the entire evening because the watermelon flavour was so subtle – it tasted natural and the ingredients are natural, which is always a bonus. The calorie content in these drinks is low too. After these, I was pretty full but this was a masterclass and after we’d learned from the master it was time for the class element. We were allowed to pick and mix our own drink. I went a bit crazy and asked for apple ice tea with egg custard pieces, as it reminded me of apple crumble and custard, which is one of the best desserts ever. Then I went a bit crazy and added exploding lime pearls, which the drink really did not need as the lime was very tangy. If I was in a real class, I’d probably have given myself a B+. It would have been an A if I left out the lime. Then the class got even more fun as we were allowed into the kitchen to truly put our creative minds to the test. 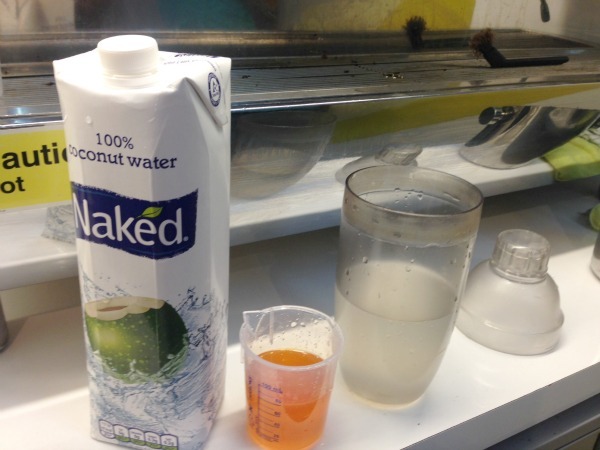 As I’d tried a lot of tea, I was curious to see what would happen with a coconut water combination. 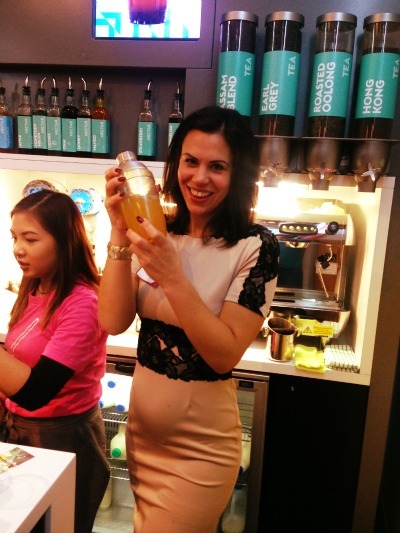 My idea was to create a pina colada tea – something as delicious as the alcoholic cocktail that you sip on a beach but in London and non-hangover enducing. Above you can see coconut water, which I mixed with passion fruit syrup and peach syrup. I enjoyed the part where I got to shake it up as you can really take out any frustrations on the cocktail shaker. Finally, I scooped a handful of exploding guava pearl into the bottom of the cup and my masterpiece was ready. How did it taste? You can see by the look on my face that I was pretty proud of myself. A + I’d say! Here’s a video the folks at Yelp made of the evening. If this makes you want to get in on the free stuff action then all you have to do is download the Yelp app – what’s stopping you? PS Join before 12 November and you can enter the Mulled Wine festival in London’s Covent Garden FOR FREE!